Filed in the Northern District Court of California, the complaint echoes many of the claims made in a first class action lawsuit regarding the same issue earlier this month. In the immediate action, three named plaintiffs allege the butterfly mechanism introduced with the 2015 MacBook, and later applied to the MacBook Pro line in 2016, is prone to failure. Though Apple advertises the ultra low-profile switch as being more responsive and robust than traditional scissor-type mechanisms, butterfly keyboards are easily defeated when dust or other particles builds up beneath the keys, the lawsuit claims. In some cases, the key switch completely fails, forcing owners to take their laptop in for repairs. Due to its design, a single broken key necessitates the replacement of an afflicted MacBook's upper casing, which includes the keyboard and battery. For machines no longer covered by Apple's warranty, the repair can cost hundreds of dollars, and for those that are, the process can leave users without their computer for a week or more. According to the suit, Remy Turner bought his 2016 MacBook Pro in April 2017 and shortly thereafter began to experience problems with a sticky space bar. He attempted to fix the issue using Apple's recommended method of spraying the area with a can of compressed air, but was unable to rectify the issue. Turner ultimately returned the malfunctioning unit to Best Buy for a replacement, though the same problem manifested. He repeated the replacement process a second time with identical results. A second named plaintiff, Christopher Martin, purchased a 15-inch MacBook Pro in December 2016 and used the device without incident until August 2017. It was around that time that the unit's space bar began to stick "roughly once every 1 to 2 weeks," a situation that was remedied by a hard press on the key. The failures began to occur more frequently over time, but the air can cleaning process functioned as a temporary fix. In January 2017, however, Martin's space bar ceased to respond to cleaning techniques and became stuck in the depressed position every couple days, where it would remain for about a week. As Martin's gratis warranty period is over, he is reluctant to fork out money for the high-priced repair. Instead, the plaintiff has resorted to shaking the laptop until the key becomes unstuck. Finally, Joey Baruch purchased a 13-inch MacBook Pro in July 2017. Shortly after taking the unit home, he encountered issues with the "R", "T" and "Enter" keys. Like the suit's other plaintiffs, Baruch found spraying beneath the key with a can of compressed air alleviated the problem for a short time, but the issue became progressively worse. Baruch took his laptop in for warranty repairs in March 2018. Apple replaced the keyboard, but the problem reoccured on the new unit, this time extending to the space bar. Aside from plaintiff testimonials, the suit cites numerous online forum posts, blog accounts and reports detailing consumer complaints with Apple's butterfly key mechanism. Beyond sticking keys, users describe troubles relating to the design including broken key caps, among other flaws. Apple introduced the butterfly mechanism in 2015 with the debut of the 12-inch MacBook. 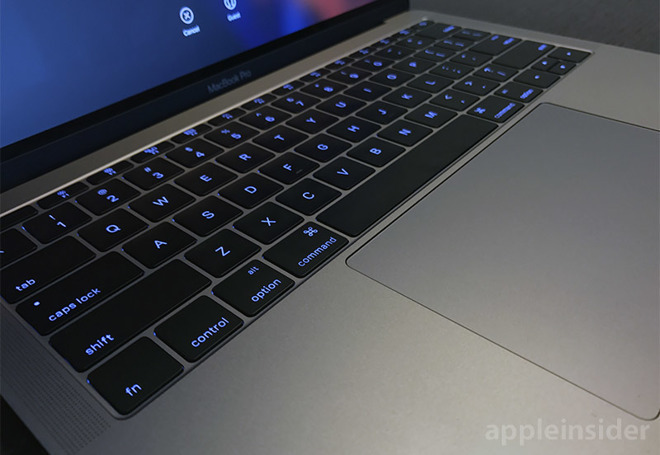 At the time, SVP of Worldwide Marketing Phil Schiller touted the keyboard as "much more precise, and accurate. In fact it is four times more stable than that scissor mechanism." Those claims are echoed in Apple's marketing for current-generation MacBook and MacBook Pro models, the latter of which feature a second-generation butterfly mechanism that offers "four times more key stability than a traditional scissor mechanism." AppleInsider investigated the issue last month, and after collecting data from Genius Bar locations and authorized third-party shops found the 2016 MacBook Pro's keyboard failed roughly twice as often in its first year of use as 2014 and 2015 MacBook Pro models with scissor-type switches. Within a week of the report's publication, a Change.org petition called on Apple to recall all MacBooks with butterfly switch keyboards. The petition, which is cited in today's suit, has garnered nearly 27,000 signatures in under three weeks. Though Apple has not acknowledged a widespread problem, it has recognized customer complaints, as evidenced by a support document detailing the aforementioned method of cleaning butterfly keyboards with a can of compressed air. Plaintiffs assert breach of express warranty, violation of the Magnuson-Moss and Song-Beverly Consumer Warranty Acts, violation of the California Unfair Competition Law and violation of California's Consumer Legal Remedies Act. The suit seeks class certification, restitution, damages and legal fees.